I wonder if I could get some quick advice as I have an OR PSTN engineer scheduled for tomorrow morning (Friday). The background is that on 6 January my FTTC Infinity2 connection experienced several disconnections and very loud noise could be heard on the speech circuit, most particularly during incoming calls. Callers either could not hear the noise or heard it only very faintly. You will be probably be aware that the rain was coming down in torrents that day. Normally my connection is very stable but the whole street experienced connection problems about 6 months ago – again during bad weather. Eventually OR had to replace some of the cabling between the DP and the premises in the street. Since then the broadband has been stable with excellent speed. So I logged a PSTN fault on 6 January with BT (after hanging on for 1 hour). They could not send a PSTN engineer until the 10th. Since then the rain has stopped and the audible noise has started to diminish until this evening it has almost stopped. I fear that by tomorrow it may not be audible and then I will be into a fight with BT over the £129.99 they have threatened to charge me for finding “no fault”. I even got an automated text tonight from BT that baldly said that the fault was on my premise and I would be charged! I would add that I have very simple wiring – an NTE5 with a VDSL faceplate (installed by OR 6 months ago). There are no extension phones although I think there might still be extension wiring connected to the NTE5. The ring wire is not connected to the NTE (at least that was what the OR engineer told me 6 months ago). I was not running HGStats on the 6th although I was using the unlocked modem. I therefore started logging after the connection problems first started to happen. Logging has been intermittent ever since as the connection kept dropping. However I can attach some stats from the 7th Jan and some current stats for this evening for information. Any advice on how to approach BT over this potential situation would be gratefully received. Please remember that you, the end user, has no relationship with Openreach. You have a contract with your CP (ISP) and it is your CP who has a contract with Openreach. As I understand it, your CP is BT and there is where the problems will start. Briefly, I will advise that you contact your CP and cancel that Openreach appointment. By my limited powers of remote divination and fault-finding, I will suggest that the fault was cased by water ingress into the network cabling which has now (predominately) dried out. I speculate that the water ingress was causing an "earth contact" fault . . . hence the noise. Looking at the lower montage (the snapshot graphs), it seems that you have a very good 40/10 Mbps service and long may it continue. Finally as all extension wiring "downstream" of the NTE5/A is entirely your responsibility I would urge you to check if, indeed, any exists. It is a very simple task -- undo the two screws that hold the lower front face-plate onto the SSFP, which in turn is fitted to the NTE5/A and carefully remove the lower front face-plate. Any there any wires connected to its IDCs? If no, then you do not have any extension wiring. I would just add to BKK's words of wisdom that you should not have extension wiring unless it was wrongly connected to the rear NTE5/A terminals or that there are any previous star wiring points in junction boxes. I'm on Infinity 2 not Infinity 1 so have a 80/20 service. My connection normally has a synch rate of 66/20 and normally achieve actual speeds of around 64/16. I'm fully aware of the contractual relationships, but it is too late to cancel the appointment anyway (it has to be by 2 pm the day before). Are you suggesting that I accept the status quo and just wait for the next rain shower to disrupt the broadband connection? That's not an acceptable approach for me. The work OR did last July was meant to permanently fix the water ingress problems in the locality - and it sems to have done so up and until the recent (admittedly exceptional) rainfall. The connections in the locality are a shambles because OR appears to refuse to fix anything properly. They laid a new cable alongside the old cable between the DP and one of the junction boxes before the premises in the street but did not install a cable with sufficient pairs for all houses. I know for a fact they ONLY connect premises to the new cable if and when the householders complained about connectivity/speed problems. The specialist OR broadband engineer who subsequently visited my property to fix unresolved speed issues also alerted me to that situation . Additionally he alluded to the risk that one day a PSTN engineer could steal a connection from a subscriber connected to the new cable in order to report a fix because he was under pressure from his management over job completion. I have no way of verifying the truth of that but after experiencing all of OR's problem denials last year it has a certain ring of truth to me. I apologise if my previous post appears intemperate but I'm really fed up with OR. I forgot to mention that the OR broadband engineer who visited me last July mentioned evidence of visible damp whilst he was inspecting the circuit run between my premise and the DP. However on the day of his visit (sunny of course !) the line checked out OK. But he also said that OR were unlikely to do anything until a permanent fault occurred. Edit: On another point the wiring on my NTE is not straightforward. I have a NTE5a (I think) with a removable VDSL faceplate. This was new and installed by OR in July 2013. The broadband connection is above the voice connection. I cannot find a wiring diagram anywhere to help me check out the wiring of this type of NTE. That is the usual problem. Until the time that the fault is permanent, such issues as the one you have experienced are very difficult to locate and resolve. Regarding the internal service wiring to the NTE5/A, I think I recall your early posts in 2011 when it was ultimately resolved. What you have currently described (connection to the modem from the upper socket and a telephony connection from the lower socket) entirely agrees with the fitting of a SSFP to the NTE5/A. Look closely at the lower front face-plate. That is removable and to its IDCs would be attached any telephone extension wiring. So in terms of "layers" (from the outside going inwards), you have a lower front face-plate, then the SSFP and finally the NTE5/A. This has been the first occasion I have had need to remove the faceplate and it does not fit 100% with pictures of others I have seen. The image shown below indicates the type of NTE5 I seem to have (extreme right) with the broadband connection above the telephony circuit. However it does NOT have the IDC connection shown at the upper front left. In my case the lower part of the face plate (ie the part with the telephony connections) does not come apart separately from the upper part of the plate with the broadband connector. I'm not sure if it is meant to work that way or not. If I separate the plate from the base unit, both phone and broadband sockets come away and the broadband connection is lost instantly. Telephony and broadband connectivity can then only be established via the test socket. I was given to understand that with this type of NTE the the broadband could remain connected whilsty testing the phone but may have misunderstood. I appreciate that a a picture is worth a thousand words but I don't want to pull the thing apart just at the moment to photograph as I'm currently collecting broadband connection log stats. Edit: After re reading my post I think what I am trying to say is that the upper and lower parts of the face plate are NOT separate parts. They appear to be held together by screws at the REAR of the plate. BTW: OR installed this NTE last July. I had never seen one like it before. There is 2 types of nte5, IDC and screw in types. I dont know if IDC has any advantage over screw in because otherwise I would think it to be obselete given how much less hassle a screw in type is to install. That certainly reads as a peculiar situation. Perhaps you could raise it with the engineer, tomorrow? For reference purposes, I attach two images below. The first is a standard Openreach branded NTE5/A and the second is one variation of the initial SSFP. I seem to remember someone saying you can only be charged if there was a fault in your wiring. If they can't find a fault then they can't charge you. Current openreach policy is they can also charge if no fault found anywhere. However with that said what counts for the end user is the contract between them and the retail isp, if the retail isp hasnt updated their policies to reflect openreach changes then the end user can refuse paying such a charge. Also if a end user wanted to persue this legally then I expect the entire process crumbles as its weak legally. Even the isp's that state a fault has to be found on the openreach side of the network, say it very vague. They dont specify a software based tester is sufficient to deem no fault. A court of law would expect openreach to make reasonable effort to prove no fault and I expect a JDSU result would be brushed aside. One line of defence would be to insist BT unlock the BT Openreach supplied modem to record all the line parameters currently operating on the end users actual equipment and then compare those figures with those obtained with the JDSU instrument. In many instances it is likely that the JDSU provides a more robust synchronisation at the expense of the maximum sync speed. I recollect reading, somewhere, that a JDSU HST-300 presents a lower impedance to the line under test than if an Exfo AXS-200/635 or an unlocked Huawei HG612 is used. As a consequence of the heavier loading, when a JDSU HST-3000 is used, the results obtained can look somewhat pessimistic. As feared the noise on the circuit was no longer audible by this morning ! However I needn’t have worried because when the OR PSTN engineer arrived he attached his test kit which immediately indicated a potential fault 75 metres from the premise. On inspection the problem was corrosion evident inside the gel crimp at a line joint in the in one of the chambers in the footpath. A retest showed that the 75 metre fault had been fixed, but audible noise had suddenly re-appeared during a quiet line test. Then odd thing was that his test equipment now showed no faults on the circuit. So he went outside again and visually inspected a joint at a different connection point nearer to the premise which once again had signs of corrosion actually inside the gel crimp at the very end of the wire (which he showed it to me). The crimps used at that particular point had three “sockets” for connections but only two were being used. It looked as though water may have been entering the open middle pocket, hanging there and eventually started to seep into one of other sockets causing the blue coloured corrosion just visible at the tip of the wire. After those crimps were replaced the noise on the line disappeared and he repeated one particularly test 3 times to ensure he got clean results. He did the test a multiplicity of times as he was uncomfortable that the second fault had not shown up on the test kit, and he wondered if he had cured the real problem. However with 3 pass tests and no audible noise there was not much more he could have done. However he then did one final type of test (“earth/insulation” test?) which although not strictly required for this particular job he did in order to satisfy himself that the circuit was 100%. He then ran into problems as the circuit persistently failed the test. After 30 minutes of trying to diagnose the cause of the problem he rang the local manager to ask for advice. His manager then informed him that this was a well known problem caused by an long standing and unresolved issue at the local exchange, and that he could safely ignore the results of that test! That surprised him (and me)! I would add that he was not a locally based engineer so was not au fait with the locality. With that he left. He was courteous, thorough and very very young (at least to my old eyes). It’s good to see youngsters taking an interest and pride in their work. I next replied to a previous text from BT advising that the fault had been traced to the OR network (and not my wiring as the text had boldly told me) and had been fixed, so could they reset my broadband connection please? Surprisingly I got a call from the broadband team in India within minutes. 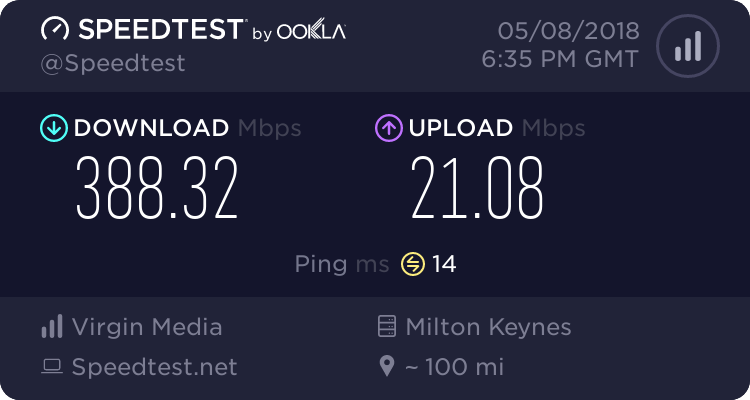 They asked me to perform a speed test (I used the BT wholesale tester) and I gave him the results (speed is currently less than 50% of what I normally enjoy, the line is heavily interleaved – previously on Fastpath and ping is hovering around 125-150ms). He said he could not do anything and would have to make an appointment for an OR engineer to visit. He is scheduled for tomorrow morning. So we shall wait and see what the OR broadband engineer has to say, but it seems a bit wasteful to send somebody to actually visit me? For the sake of completeness I will let you know what happens. Bkkat: my NTE looks similar to the lower of the two photographs, and the PSTN engineer showed me how it all should fit together. Looks like there was a failure of understanding on my part! A predominately good result. Excellent! That's a relief. An easily made mistake.